On June 14, 2005, a series of moderate to strong earthquakes occurred in the Rat Islands region of the Aleutian Islands (red stars on the above map). The sequence started with a M5.2 event at 08:03 UTC and the largest event of M6.8 followed 9 hours later (at 17:10 UTC). The largest earthquake was situated 49 kilometers (31 miles) south-southeast of Amchitka. The epicenter (largest star) was located at 51.31N and 179.41E at 51.7 km depth. 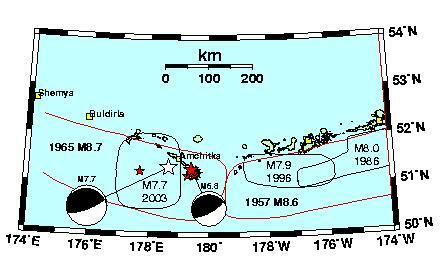 This earthquake is the largest to occur in this region since the magnitude 7.7 event on November 17, 2003 (white star on the map). The AEIC located several foreshocks and aftershocks of the M6.8 event with the largest aftershock of M5.6 four and a half hours after the main shock. The M 6.8 earthquake occurred on the convergent boundary between the subducting Pacific and overriding North American crustal plates. This region, where the two plates are being forced directly into one another, is one of the world's most active seismic zones. Over one hundred earthquakes of magnitude seven or larger have occurred along this boundary in the past hundred years.